North Dakota oil production grew a little less than 10,000 b/d from September to October to set another record with 941,637 b/d. With current weather conditions, it will take an exceptional November and December for the state to surpass 1 million b/d before year-end. 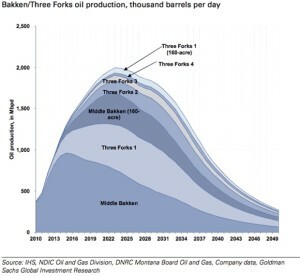 The Bakken has surprised us before, but it looks like it will be some point in the first quarter before North Dakota joins the million barrel a day club. The state also set a record in October for natural gas production with 1.07 bcf/d and for the number of producing wells with 9,900. With ~200 wells coming online per month, the state will easily surpass 10,000 wells before the end of 2013. Pretty amazing for a state that had just ~3,600 producing wells at the beginning of 2008.